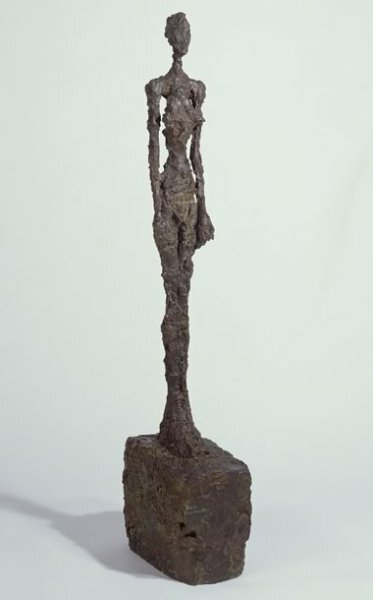 MILAN – DO I GO? I’ve mixed feeling about visiting Milan. After ten visits to Da Vinci’s Last Supper at Santa Maria della Grazie I’m not enthusiastic about all the insanity you have to go through to see, next to Michelangelo’s David in Florence, the most visited work of Renaissance art in the world. Truth is, its frustrating. Large tour companies book entire months as much as a year in advance. They do, essentially, control any/all ticket sales. Any individual tickets that become available are almost entirely based on cancellations made by the tour companies. Recently, tickets were not available ten (yes, ten) months in advance of one of my small group tours. If you wish to make reservations with Viator, or other large tour companies in Milan, to see the city by bus – and they do offer very good tours that way – then that’s the way to go. If you wish to give it a try, link here to see if tickets for your desired date are available. 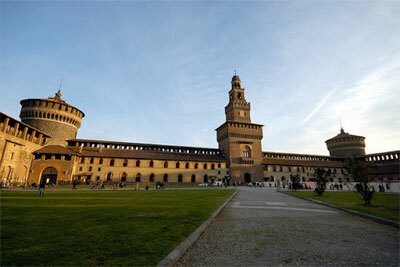 Despite the challenges presented by a visit to the Da Vinci, this very modern Italian city offers many other delights. Read on. The Duomo: What a confection of white marble! Spectacular. The Piazza that fronts the cathedral of Milan is one of the largest in Italy. The scale of the structure dwarfs even that huge space. Inside the cathedral are stained glass windows, behind the main altar, designed by Marc Chagall. These windows were installed after the bombings of WWII. 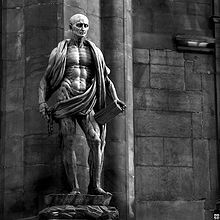 Marco d’ Agrate’s 1562 sculpture of Saint Bartholomew is one of the most unusual in Europe. 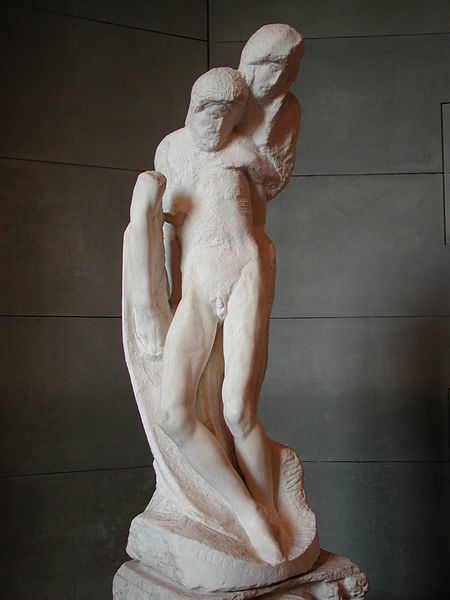 The saint was flayed alive (that is, skinned alive) so the sculptor chose to depict Bartholomew’s musculature exposed, his skin wrapped around his body. Fascinating and disturbing, at best. 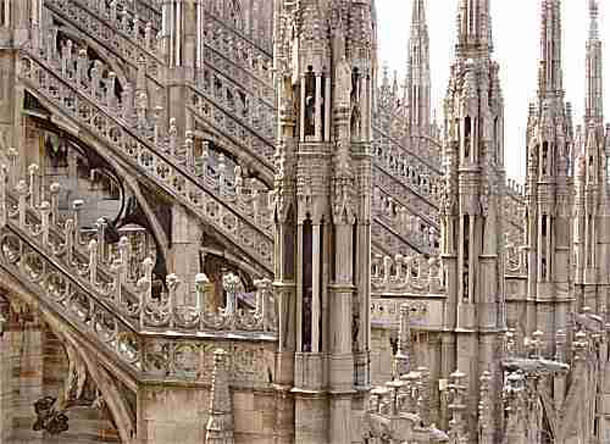 If you wish to visit the roof of the duomo – and I highly recommend you do – go to the southeast corner of the church where you will find the elevator to the roof. The number and beauty of the statues and gargoyles is mind-boggling. The Galleria Vittorio Emanuele and loggia walkways around the Piazza Duomo. Next to the Cathedral of Milan is the Galleria Vittorio Emanuele. Completed in 1877 it is the first covered ‘mall’ in Europe. Today, fashionistas rub elbows with tourists in the many cafes within. Impeccably dressed Milanese move effortlessly in and out of gorgeous, expensive clothing and jewelry shops. The mosaic and inlaid floors are, in and of themselves, a wonder to behold. At the center crossing of the galleria floor are mosaic coats of arms of the four major cities of Italy. 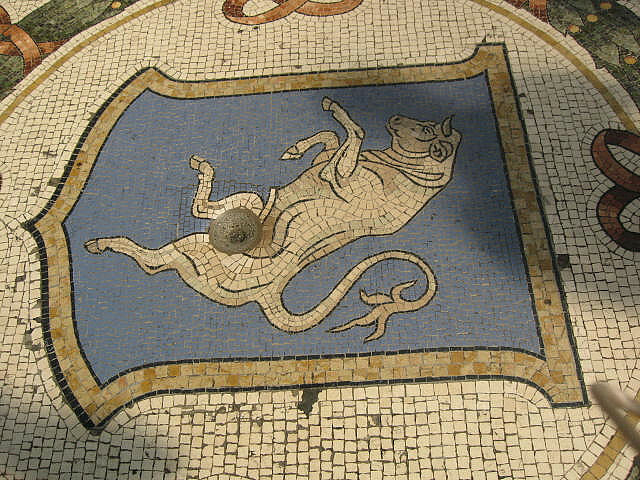 Turin, west and south of Milan, uses a bull as its symbol. Tradition has it that, if you place your foot on the bulls, ahem, private parts and spin 360 degrees without your other foot touching the floor, you will have good luck. It is really fun to watch people try this from an unobtrusive corner. And yes I’ve tried several times, all to no avail! If the deep depression in the floor above the unfortunate animal’s lover-section is any indication, a great many tourists and locals believe in the tradition! At the north entrance to the Galleria is the Piazza della Scala which fronts the world famous Opera House of the same name. This is a lovely park area in the center of Milan. There are benches for a much needed break and people watching, a national sport in Italy, is always fascinating. For those obsessed with, or just interested in, opera, a visit to La Scala offers interesting glimpses in to the world of music. There is a small museum inside the building and visitors are also afforded the opportunity to view the interior of the theater from one of the third level private boxes. This is certainly not any waste of time; if anything, the visit underscores Italian’s love of music and their dedication to the opera composer’s art. If your interests tend to the current trends in clothing design, then this is your street. Known as the headquarters of Italian fashion, the boutiques for shopping, and the people watching, offer fascinating glimpses into the world of “La Moda.” This wide, truly monumental, boulevard shares its justifiable reputation with the Fifth Avenue in New York and the Rue du Faubourg Saint-Honoré in Paris. This is one of the most expensive commercial / residential areas of Milan. Be aware that costs for meals and beverages are at least one and a half times the average cost for such things in other areas of the city. 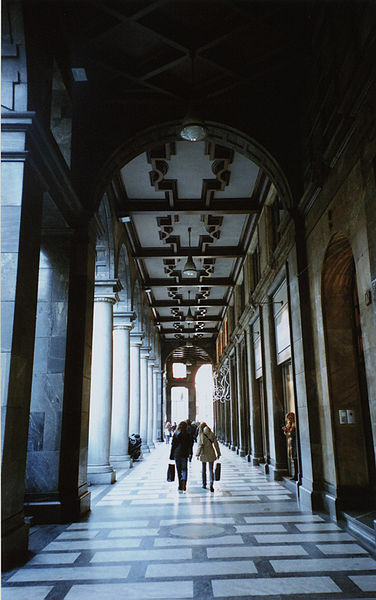 In the heart of Milan stands one of the most historically intriguing and architecturally powerful buildings in the world. From 1392, when the Visconti family began improving and strengthening the fortifications, to the time of Francesco Sforza who transformed the buildings into his private ducal residence, this is a building whose construction reflects the political history of Italy. You can visit the fortress in about two hours. There are several spaces within the structure now used for art and fashion shows, so it is very helpful to check the site’s web resources before you visit. See information below under “If You Go.” A MUST even if you find history boring. This is one place guaranteed to fascinate. 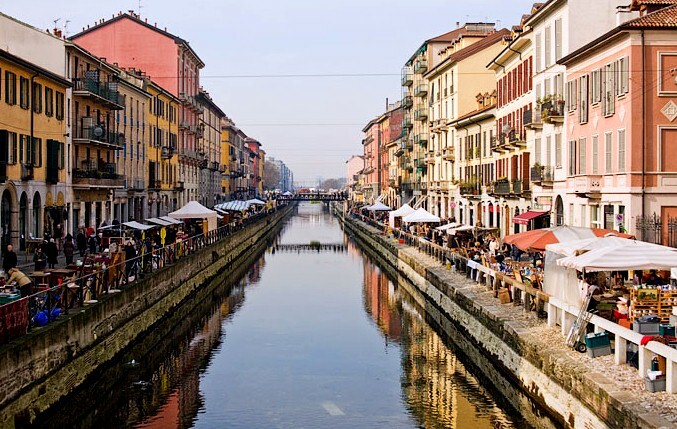 Surprisingly enough, there is an area of Milan that is crisscrossed by navigable canals. Southeast of city center, and easily reached by using the Green Line of the Milan subway system (watch your personal belongings! 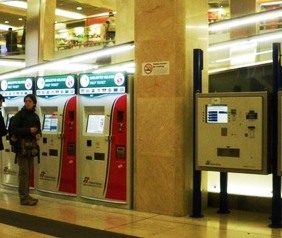 ), you will exit at the Porta Genova train station. As you exit the station you are in the heart of Milan’s answer to Venice. If you go in the winter months, don’t be surprised by maintenance work and dry canals. This is one of the liveliest arts districts of Milan. Evenings are always crowded with all ages, some heading to clubs, others to galleries that tend to the newest Italian talents. Enjoyable, fun and truly memorable. Milan’s Stazione Centrale is one of the largest train stations in Europe. Connections to all cities across Italy are available, from regional trains to the fast Eurostar Italia. There is a huge subway station under the station and access to all areas of the city are easy. There are kiosks throughout the station that facilitate the purchase of tickets. The kiosks have touch-screens and offer numerous language options for the simple step-by-step purchase process. NOTE: Be very careful with your personal belongings while in the Metro stations and trains in Milan. Pickpockets are plentiful and determined. Remember that you cannot just show up at the entrance for the Last Supper and expect to enter. Pre reserved reservations are mandatory. 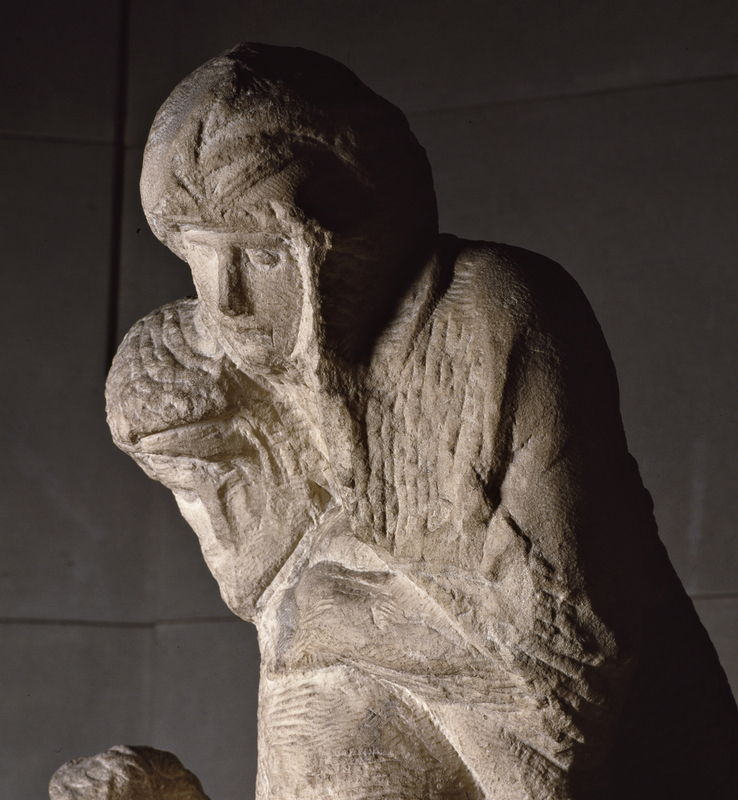 Hours: Every day: 7:00 a.m. – 7:00 p.m. Last admission at 6:45 p.m. Free admission. The museum is open everyday except: 7 December, afternoon of 24 December, 25 and 26 December, 31 December afternoon, 1 January, Easter Sunday, 1 May, 15 August.